If students were considering the Bill of Rights in a group, for instance, they would discuss what they know about the Bill or Rights, which may be their content and a bit about the reasons they were added and who insisted upon them. What is my instinct/gut reaction telling me about this? When discussing the Bill or Rights, students might consider how they feel about the amendments. What would their lives b e like without them? What emotions would they feel if they were taken away? With the black hat on, students consider the negatives or drawbacks of a particular idea or concept. What are potential bad results of this decision? For instance, when learning and discussing the first 10 Amendments to the Constitution, students might discuss the drawbacks of any of the Amendments. Students might discuss the tension between liberty and safety. Sometimes more freedom means more risk, but to our founding fathers, liberty was of more value than protection that required the sacrifice of freedom. Do your students agree? The yellow hat requires considering all of the positive aspects of the idea in consideration. What are the benefits of this idea? What good would come from this decision? With regard to the Bill of Rights, students might discuss how citizens of the past and present benefit from these enumerated rights. What ideas have we got? What are some possible solutions to this problem? With respect to the Bill of Rights, students might consider if there ought to have been any changes to the Bill or Rights? Is a new Amendment to the Constitution necessary to secure present liberties? This might lead them to a discussion about how new Amendments to the Constitution are passed. If students were to put on the blue hat in their discussion of the Bill or Rights, they would evaluate their own thinking and ensure that they have thought deeply and critically with each of the hats on. Did everyone have a chance to speak? Are all thoughts recorded? Perhaps the goal of the discussion was to help students think about the topic before writing a paper on it. Was the discussion adequate to provide a jumping off point to begin writing? • During Literature Circles: Have students discuss an aspect of the novel/picture book they are reading using the Six Thinking Hats. For instance, if a character in the novel is trying to make a decision, the students could use the strategy to decide what they think the character should do. • During discussions of history: Use the Hats when students are discussing historical events. Example: should the United States have used the atomic bombs on Hiroshima and Nagasaki at the end of WWII? • To Aid in Class Decision-Making: Include the class in making a decision that impacts them. 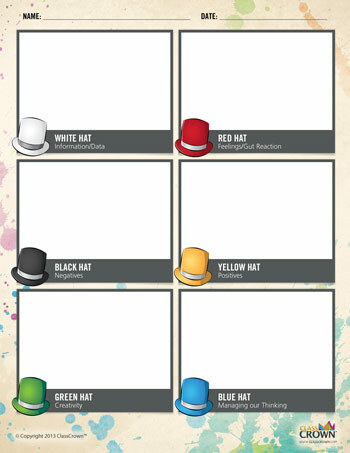 Manage the discussion using the Thinking Hats strategy. For instance, should tests be given on Fridays, or will students likely perform better on another day of the week? • To Help Students Prepare for Writing a Paper: Use the 6 Hats Strategy as a method for brainstorming for a paper. Example: use to help prepare for the writing of a persuasive paper so that all points of view are considered and counter-arguments can be rebutted.